If you're like me, you love testing products for free to keep. I generally don't even care if I do not receive payment for product testing, and this is a good thing because most of these panels don't pay you for the things you test and keep. You are supposed to just consider the fact you get a free product to keep your reward. But, that's fine with me! If I get something for free and it's something I might buy, it's money I didn't spend. And money saved = money earned. There are a ton of product testing panels out there and actually many of the popular survey panels occasionally send products out that you can test and keep in addition to sending out surveys. But over the last year there have been about eight panels that really seem to stand out from the rest. This is one of my favorites! PINCHme offers a generously sized box of samples that you can grab once a month. You just have to check the site to see when the box will be available to request. The samples PINCHme provides are always from name brands you probably already know and love. If this sounds like something you want to do, go here to sign up for PINCHme or read our PINCHme review first to learn a little more. This is a survey panel that is known for also doing lots of product testing. And unlike most other panels that let you do product tests, Pinecone will almost always pay you in addition to letting you keep the product you've tried out. Note that after you've had time to do your test, Pinecone will ask you to answer a survey about your experiences with the product. Go here to sign up for Pinecone (note they aren't always open to new participants) or learn more about how it all works in our Pinecone review. Smiley 360 is an amazing panel that almost always has some new campaign you can participate in. I've gotten in on several campaigns in the past and have received multiple products to test in my mailbox along with valuable coupons that I can pass out to my friends and family in addition to testing the product. After you test the product, you are asked to share your experience in as many ways as you can — across social media, word of mouth, etc. Go here to sign up for Smiley 360. Influenster is another excellent panel that seems to have something new for me to participate in at least once a month. I have received one of their popular “Vox Boxes” that contains a variety of full-sized samples as well as two big bottles of Palmolive dish soap to test recently. Just like most panels, you need to spread the word about whatever you are given to test. You can do this via social media, word of mouth, video, etc. And you need to let Influenster know that you did it so you can continue to get asked to participate in future campaigns. Sign up for Influenster here or read our Influenster review first. This one is similar to BzzAgent because after you get your product or products to test, BzzAgent will ask you to share your experiences with people you know — not necessarily with BzzAgent. And you can do this via word of mouth, social media, texting, etc. BzzAgent has been known to send out some pretty good products. I've used them and gotten garbage bags, microwaveable steamer meals, hair products, and more. Go here to join BzzAgent or read my BzzAgent review first. The Pink Panel is a product testing company that specializes in skincare and makeup. So this one would be great for you if that's your thing! To join, you have to fill out a short questionnaire to help them understand how much you spend on makeup and skincare products. Then, you can get notified when there are new opportunities for test and jump on them! The Pink Panel has a very popular Facebook page that you can follow as well to stay in the loop when there are new tests. Go here to join the Pink Panel or read our full Pink Panel review to learn more first. While Crowdtap doesn't seem to have as much of a focus on product testing as it used to, they still do occasionally have opportunities for you to get in on tests as a member. Once you join, you'll get frequent opportunities to answer various questions and earn rewards like gift cards. Sometimes the questions you answer will lead into invitation to test products. Go here to join Crowdtap. That's pretty much it for product testing websites. 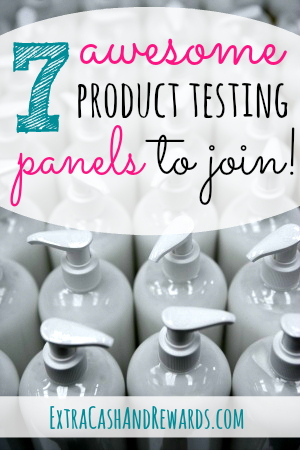 What product testing panels do you use? Post originally published on July 11, 2013. Updated and republished on March 29, 2019.
thanx for the great info! I joined BzzAgent, Influenster, Smiley 360, and Swaggable. Hope I get something to test soon! Hey, I was wondering if any of these sites are for Canadians? I use bzzagent and they are great. I’ve already gotten 4 kits in the past month! But I can’t seem to find any other Canadian sites! I am not 100 percent sure, but it probably says so in the terms and conditions for each of the sites. You can always try signing up and see what happens. Good luck! I have been a BzzAgent and an Influenster since 2012 and I’ve gotten tons of items from them. Love it! Can’t wait to sign up to try the others.